I have mentioned HDR (high dynamic range) photography before… two photographs of bright and dark merged together for a single image. The photos can be rather energized since your able to see a full range in a single photo. Previously, I talked about an app that snapped two photos and merged for you. The Top Camera app developers recognize that there isn’t always enough time to take the two photos and wait for the merge. 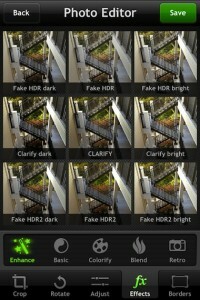 The app offers true HDR photography, but with this update you can ‘fake’ it a bit. The app now comes with 9 filters across a range of HDR and Clarify enhancements. Each effect can be applied and then adjusted with a slider to get the desired impact you were looking for in the single image.